At first, using a paid access feature may appear to be something negative. After all, why pay for something you can get for free elsewhere? While that may be true in some cases, it’s a lot more complicated than that! In fact, using a paid access feature can be incredibly beneficial for everybody involved. And with that, we don’t mean just the person who gains income in the end. Read more to find out why. Restricting access is one of the biggest benefits of using paid access. With chat rooms full of popular and controversial topics, it’s hard to keep track of everything. There are almost always a few bots, scammers, or spammers around to ruin it for everyone else. We can’t really control these kinds of people. Fortunately, paid access can remove this almost entirely. For a very cheap entrance fee, you can likely keep out most trolls, especially the people who try to interrupt the experience others are having. Through paid access, you can limit users from using your chat room as entertainment, but you would also keep the ones who have good intentions. These are the people who you already think of as friends. I know that I’d like to have a peaceful and decent chat than one with trolls everywhere. While you can achieve this through watchful moderation, that can take quite a bit of time and manpower. The use of automated filters can help, but a human moderator is still almost always required, and that’s usually you. While this need is not necessarily eliminated through paid access, it is reduced significantly. You can reduce it furthermore when used with such automated filters. 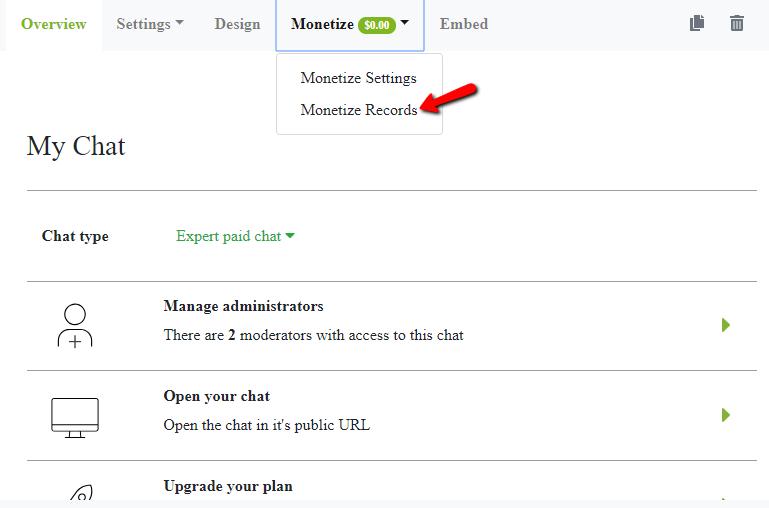 A paid access feature will ensure that chat participants really want to be there to contribute. After all, if someone is willing to pay money to enter, they’ll likely also have a real interest in participating and engaging with it. Of course, no one’s going to just waste money. At the same time, this lets the other users know that they are serious about chatting. This is where it’s at; this can give the whole community a sense of safety and belonging. Generally speaking, privacy alone is a great incentive to install a paid access feature. If people wish to discuss private or personal things in the chat, you can use a paid access feature to give them a safe space that doesn’t easily allow outsiders in. While in traditional chat rooms anyone can either participate as a guest or simply make a free account and join, a paywall acts as a wall in the most traditional sense. 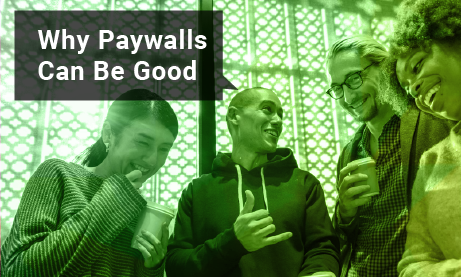 How about using paywall for the benefit of charities? There is always someone who benefits from the payments made to enter a chat. However, that someone doesn’t necessarily have to be the chat owner! Instead, you can take the money gained from the chat room and donate it to a common cause like charities or your local church and orphanage. If you do this, make sure this is known immediately as it can be a big incentive to new community members who wish to join. Some people have reservations when faced with a paywall. However, if they know that they’re supporting a good cause, it can help ease those reservations. Like me, I don’t really mind paying as long as I know it will be used for something good. Another thing to note is paywall is equal to paid access. Even I, myself, get really confused at that! It’s definitely important to consider the endgame of this paywall. The price for entry will have a huge impact on how the measure is received in the end. While some content may justify a very large price tag, this should always be considered carefully. This can be a drawback and drive away dedicated or interested users. Instead, set the price to something affordable and reasonable for users. A trading community that gives advice on stock trading may want a higher price to keep their tips and ideas as exclusive as possible. On the other hand, an expert’s advice through online therapy may use a very low entry price, depending on the therapist. They could even have it double as a membership fee or use it to support local amenities or excursions. 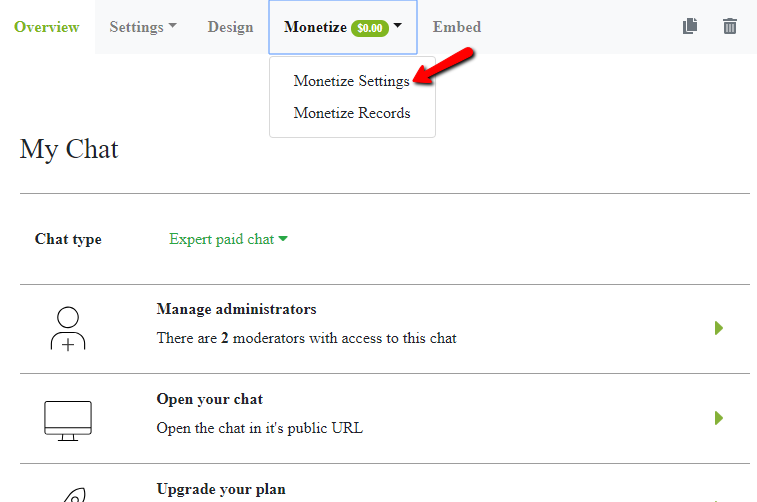 The real question is “how do you set up a paid access feature via paywalls?” I’ll show you a quick overview of how you can change your chats from free to paid. 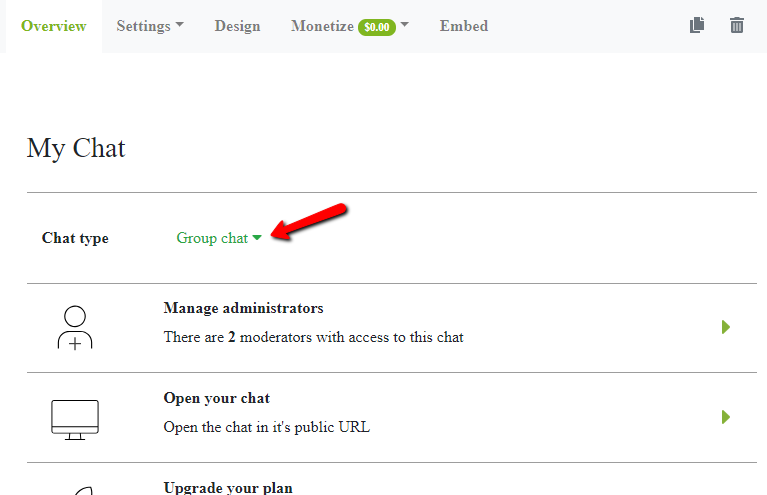 First, in your admin panel, you will see “Chat Type.” This is the option that lets you change your chats from free to paid as I said earlier. 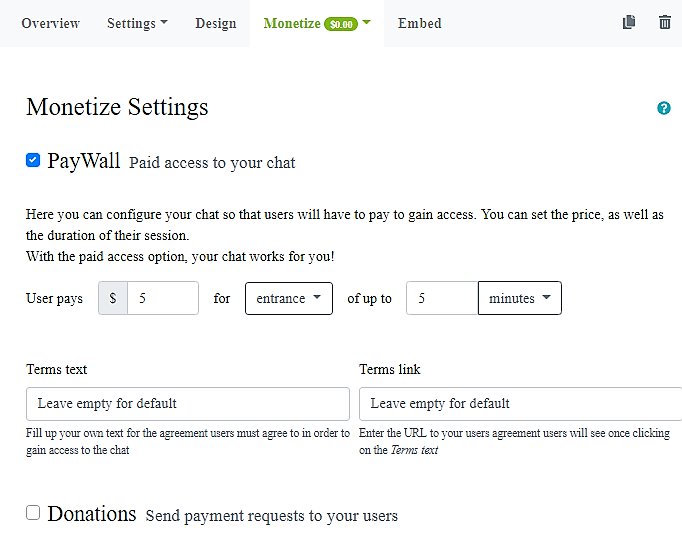 After choosing which chat type fits best for your site, click “Use PayWall” to activate paid access features. This is where the fun starts! Now, now, don’t get too excited! There’s still some more things to do. 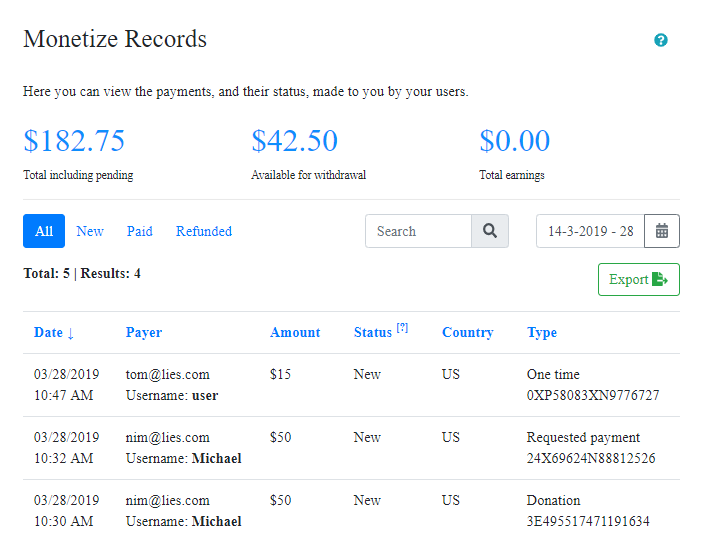 You can also adjust the payment settings in this page. This means this is where you determine the entrance fee of your chat room. Yay for more money! This is just an example, so it’s blank. But if you keep the sales us, the page will be full in no time! A paid access feature will help you keep your community intact and you can avoid future trolls. To know more about its features, read our article about it here. Whatever the chat is used for, if set up correctly, a paid access feature can bring immense value and benefits to the participants. Furthermore, they can even improve the overall experience in the chat and make it memorable. 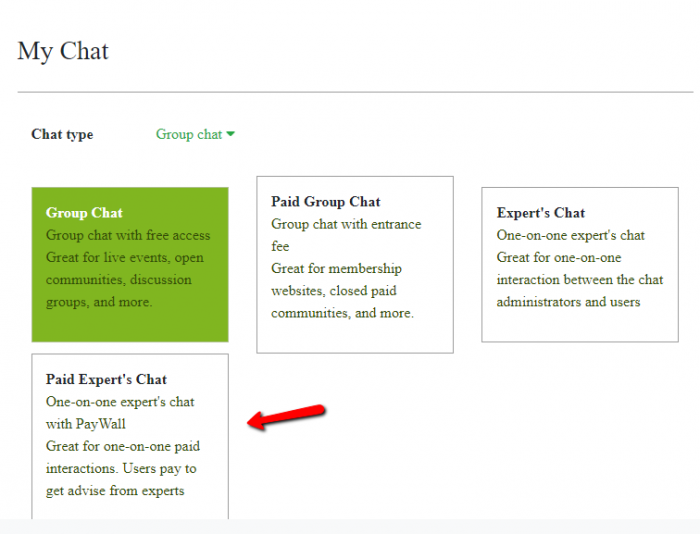 With the use of paywalls, the amount of time and effort that goes into moderating the chat reduces significantly. And best of all, all participants can focus on getting the most out of their chat experience.